The What: At ISE, Leyard and Planar expanded their Leyard DirectLight LED Video Wall System product line to include what the companies say is the smallest fine-pitch LED video wall display in the industry, a pixel pitch of 0.7 millimeters. The What Else: The Leyard DirectLight 0.7 millimeter display provides high-resolution images at the closest viewing distance. The Leyard DirectLight 0.7 allows for 4K and 8K resolution video walls in smaller spaces, matching the pixel density seen in traditional control room video walls but with a completely seamless and uniform image. 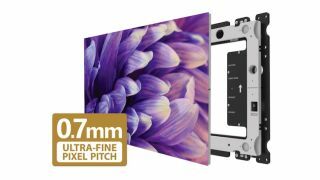 With the addition of a 2.5 millimeter model, customers now have a wide range of options from which to build high resolution LED video walls tailored to the resolution requirements of almost any indoor environment. The Bottom Line: The Leyard DirectLight LED Video Wall System is a family of seamless, fine-pitch LED video wall displays that allow for slim, wall-mounted, front-service installations in indoor environments, delivering high resolution and clarity with reliability. Leyard DirectLight incorporates the Leyard DriveSense technology delivering high pixel density with greater power efficiency.